INCA Internet is an information security company based in Republic of Korea , and develops the ‘nProtect’ line of computer security products. Young Heum Joo founded the company in January 31, 2000, and is currently the CEO and President . The company holds more than Currently 70% of the market share of information security for Korean financial institutions and more than 90% of game portals security [ citation needed ] . It is a public company limited by shares, Young Hem Joo being the largest stockholder, followed by JAIC from Japan and MeesPierson from the Netherlands. Other major investors include JAIC, Japan’s largest independent venture capital firm, and KDB (Korea Development Bank). The main business areas of INCA Internet include online PC security services for financial institutions , online business corporations, and online game companies among others, online game security solutions, a united PC security solution for corporate internal security and a B2C business such as online Anti -Virus for normal internet users. Internet Service Provider (ASP) companies in the online PC security industry. The products are widely used by Korean and Japanese financial institutions, public institutions, worldwide on-line game companies. INCA was awarded the IR52 Jang Yeong-sil award, which is considered the highest and most reputable award in the Korean industrial technology field. It acquired the ISO 9000Certificate by TUViT, an IT certification institution affiliated to the German RWTUV group. INCa Internet was the only information security company in Korea to be included in the Deloitte Technology Fast500 Asia Pacific 2007. INCA Internet currently has customer companies in 23 countries and a total of more than 200 million users in over 170 countries . INCA Internet first entered the market in January 2000, and acquired a global patent through ‘nProtect Netizen’ which was the first program to provide a real-time client PC information security service. INCA Internet has developed into a strong corporation with an independent technology and is leading the Korean and Japanese security market in the financial and electronic commerce industry. When INCA Internet Was first founded, the internet use’s fast spread, ill-Intended cyber attack pattern diversification, the user’s nests for various complicated malware started to show the limit of single one-time purchase security solutions and HW-based information security products. Since then, INCA Internet HAS Quickly adjusted to the information security market trend and year Provided end-user based user friendly PC security solution optimized for That Is today’s Internet environment. All INCA Internet nProtect products apply to SaaS (software as a service) model. It was the first company of the security industry to Provide internet banking security and online HAS spread since the SaaS model into PC security and web security. 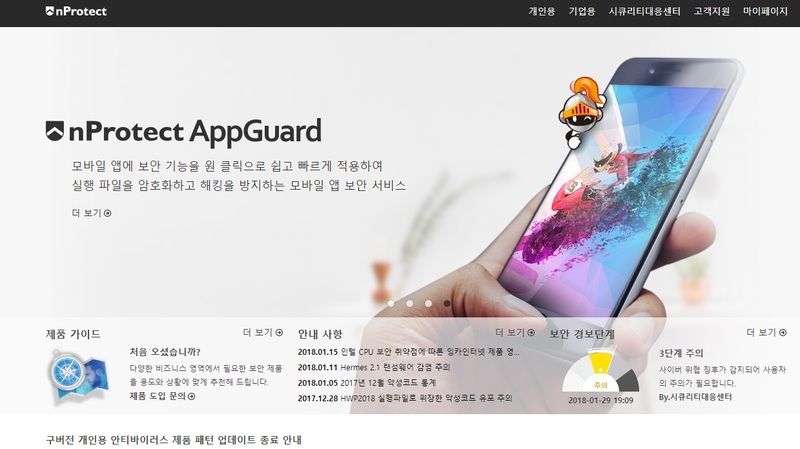 The company holds more than Currently 70% of the market share of information security for Korean financial institutions and more than 90% of game portal security . INTERNATIONALLY, INCA Internet mainly provides security solutions for China , Japan , Southeast Asia , and Europe . Companies such as JCB Card,  UFJ ,  Tokyo Star Bank  are among some of the corporations using INCA Internet’s protection. Hides the game application process, monitors the entire memory range, terminates applications defined by the game vendor and INCA to be cheats, blocks certain calls to DirectX functions and Windows APIs and auto-updates. Provides unified administrator features for security managers and electronic managers within the organization. Prevention of information leakage of information and security. Provides web security by inspecting the security vulnerabilities of providing and providing detailed descriptions and solutions to the vulnerabilities. Inspections the Top 10 recommended security inspections by OWASP and further inspections for new, popular attacks and vulnerabilities of the server or service. Provides fast inspection through multi-threaded inspection and provides a better understanding of security. Most of the functions run at kernel level of an OS , so versions of Windows that use UAC or User Account Control ( Windows Vista , Windows 7 and higher.) Are unable to run smoothly. Moreover, this program can only be used with USB Keyboard , in conjunction with nProtect caused by same reason. nProtect Netizen, nProtect Personal and nProtect Keycrypt are programs used mostly for internet banking in Korea. They are programmed to terminate processes that are not associated with banking, but processes are terminated indiscriminately if they are deemed to be a threat and a compromise to the system’s stability. These programs also inject into their existing processes, and sometimes collide with other anti-viruses. More problematically, Korean banks do not update their program every time INCA releases an update. Jump up^ “INCA provides security for JCB Cards” . Yonhap News . 2005-01-26. Jump up^ Simply go to Internet banking page of the Post Office of Korea,http://www.epostbank.go.kr/?dp_id=D_001and try to run the banking menu. Using MSIE, you can see many Security Alerts. Using other browsers, you will be unable to proceed. That page means’ If you see this message, pleaseallow all(Message for only MSIE).